With so many websites competing for Google rankings, the fight for visibility in search engines is tough. Yoast SEO plugin is one of the most popular SEO plugins used on the WordPress platform. It incorporates everything from a snippet editor to real-time page analysis functionality that helps you optimize your pages content, images titles, meta descriptions etc. Title tags are an especially crucial aspect of SEO. They not only tell search engines what the web page is about but are the first thing a user sees in the search results and can be a deciding factor whether they choose to click to visit your website. Yoast SEO gives you guidance on whether your titles are good or poor. 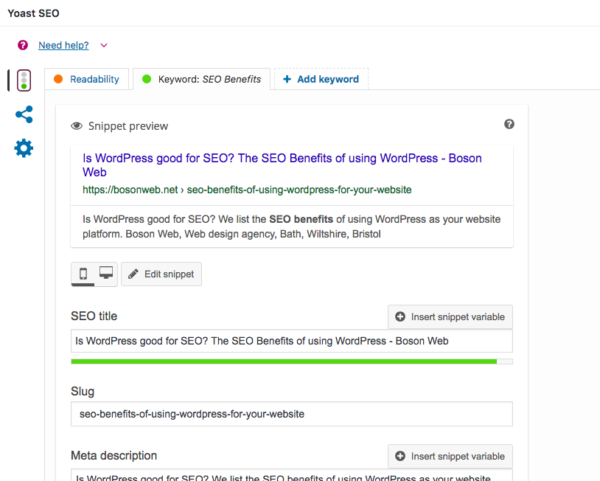 In WordPress, it’s easy to create unique meta-descriptions. Whether you’re building a landing page or a blog post, you can create unique title tags, meta descriptions, and URLs that are optimized to the keywords your potential customers are searching for. WordPress allows you to create and submit an XML sitemap. An XML sitemap lists a website’s important pages, making sure Google can find and crawl them all, and helping Google to understand your website structure. We use the Yoast SEO plugin to generate our XML sitemaps, it creates an XML sitemap for your website automatically but also gives you the option for you or your developer to create your own. We build our WordPress websites with simple and clean code, allowing search engine bots to index your site with ease. However, it’s important to note that some plugins and themes do contain poor code which will affect your search rankings. If you don’t keep your website maintained, over time the code can become messy and can affect the speed of your website, affecting load times. In the worst case scenario, it may even crash. So make sure your web agency has an in-depth knowledge of WordPress and it’s plugins and can help you maintain your plugins and website. WordPress sites tend to have fast load times that can be made even faster through certain plugins, like the WP Super Cache plugin, created to optimize site speeds. However, it’s important to remember that load time can be affected by many other factors. Google does not read images in the same a human does. It relies on supporting information to tell it what an image is about. Information like the image title and ‘alt’ text and file name can be edited, giving you another way to add keywords and help Google to identify an image. WordPress allows you to easily do this through its media library. You don’t need a skilled web developer to upload content on WordPress. WordPress makes blogging and managing content a simple process. Once the website has been built, you can upload content yourself. And as we know, regular content updates and blogging is essential for a business that wants to stay relevant and rank well in search engines.